A covert organization, deeply embedded in the American political establishment, is actively working to undermine a rational Middle East policy. With powerful lobbyists, a massive grassroots and campus presence, and seemingly limitless resources, this lobby aims to maintain American troops throughout the region, build up its weapons arsenal, and silence those attempting to assert their independence from its hegemonic rule. However, lost in much of the conversation surrounding the book itself is a complex dynamic regarding Middle East power and influence in Washington. In fact, elements of the so-called Arab and Israel lobbies work in tandem to advocate militarist U.S. foreign policies. Standing in opposition to this formidable alliance—and playing no role in the “Arab Lobby”—are various Arab civil society groups and their allies in Europe and the United States, who are working to reduce the U.S. military presence in the region. 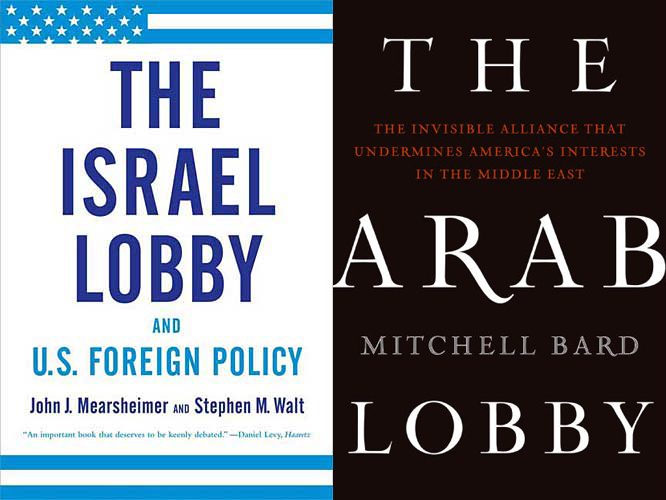 Characterizations of the “Israel Lobby”—such as Stephen Walt and John Mearsheimer’s depiction of a “loose coalition of individuals and organizations who actively work to steer U.S. foreign policy in a pro-Israel direction”—are often prone to criticism for oversimplification and excessive generalization. Nevertheless, there is increasing acknowledgement among observers that the disproportionate political influence of U.S.-based organizations and individuals ideologically committed to Israel has led to an unbalanced U.S.-Israeli relationship that is hurting both U.S. interests and Israel’s long-term security. In response, a growing chorus of largely right-wing actors—including the likes of Bard, Daniel Pipes, and Steven Emerson—have sought to divert blame by conjuring an opposing boogeyman. Borrowing a tactic from the Walt and Mearsheimer playbook, these ideologues conflate a number of different political and economic groupings under the same heading: the Arab Lobby. It makes little sense to lump together the energy and arms ambitions of states such as Saudi Arabia with organizations working to demilitarize the Middle East. Still, there is one component of this heterogeneous cluster that bears serious consideration, especially insofar as it appears to encourage U.S. militarism in the region in much the same way Israel’s hawkish supporters do. The influence of the oil-producing Arab states is beyond doubt. The Saudi regime has leveraged its vast wealth to retain its power, build its military capabilities, and solidify its status as a regional power. In September, the Obama administration proposed the largest arms sales in U.S. history to Saudi Arabia, including $60 billion worth of fighter planes, helicopters, and other assorted weapons. Despite the rancor the proposed sale is causing in Congress, there appears to be bipartisan consensus that the weapons will benefit U.S. interests. Much like the U.S. multi-billion dollar annual military aid to Israel, the weapons are intended to help maintain the status quo in the region. While in the past, notably in the 1980s, Israeli lobbying groups worked to stymie U.S.-Saudi arms deals, today the Saudi and Israeli governments frequently cooperate to maintain the current balance of power and secure steady U.S. military support. Eager to block the potentially destabilizing effects of Palestinian nationalism, the Saudis have consistently pressured Palestinian leaders to give in to Israeli demands. In addition, official Saudi media has been frequently criticized for its connections to the Israeli government, and several prominent Saudi sovereign funds have invested heavily in Israeli infrastructure. If Saudis and Israelis appear more prone to cooperation than antagonism these days, the actual fault line of the lobbying conflict is not found in ethnicized lobbying arms connected to state geopolitics, but rather between pro-militarist forces and populist movements in the Middle East and their Western supporters. The fundamental error of Mitchell Bard’s conception of the Arab Lobby is the association of disparate—and diametrically opposed—groups under a single umbrella, based on little more than a common language. A far more accurate depiction of the battle over Middle East influence would place both Saudi Arabia and status quo forces in Israel on one side, advocating a steady import of advanced weapons, the perpetual presence of U.S. troops, and the stifling of democratic aspirations of oppressed majorities. On the opposing side would be activists and isolated politicians opposed to foreign occupations, militarization, and outside influence in the Middle East. Of course, the homogenization of Arab political players is a common enough occurrence, but this particular conflation not only fails to take into account shared Arab and Israeli interests; it also delegitimizes other anti-militarist movements by fabricating an association that simply does not exist. Rather than sharing objectives, Saudi-led oil interests remain separate and distinct from organizations working toward greater popular empowerment and rights, including Palestinian national groups, human rights organizations, and opposition political parties. The so-called Palestine Lobby wields no significant power, nor has it had much success in its efforts to improve relations with the U.S. policy establishment. Unlike other components of the “Arab Lobby,” Palestinian activists are not well-funded or well-connected, do not employ entrenched lobbyists, and cannot hope to match the lobbying power of their opponents. These activists tend towards grassroots advocacy in their quest for greater balance in U.S. relations with the Israelis and the Palestinians—in fact, they are one of the few groups with legitimately anti-militarist ambitions in the Middle East. Tellingly, some factions of the pro-Palestinian movement have reserved their bitterest complaints not against Israel or the West, but other Arab states. There is no Arab Lobby, at least not one that reflects Bard’s vision. As wealthy Gulf States advocate for their own objectives, they have little time or patience for rabble-rousers attempting to “upset the boat.” Israel is not a danger to Saudi Arabia, nor vice versa. But the governments of both these states along their supporters, in the pursuit of their ideological and material interests as well as encouragement of continued U.S. military intervention, pose a danger to civil society throughout the region. Jewish organizations working for a demilitarized Middle East—such as J-Street, Israel Policy Forum, and Jewish Voice for Peace—should be similarly disaggregated from their more militarist counterparts. J Street in particular has been vociferous in its condemnation of the Israeli occupation and the use of overwhelming military force in Gaza. It should be noted, however, that J Street continues to support U.S. efforts to maintain “Israel's qualitative military edge” as “an important anchor” for the peace process. A naive depiction of competing ethnic factions—Jews against Arabs—fails to provide a framework for understanding the diverse, cross-cutting goals of Arab-based organizations and their competing interests. The drive to militarize the Middle East stems from shared interests of entrenched powers, be they Israeli or Arab. The unfortunate victims of their militarized agendas and oil-influenced policies are the people of the region, from dispossessed Palestinians to discriminated Shi’a of Yemen. The predilection of the U.S. government to flood the Middle East with ever-increasing supplies of weapons is closely linked to the lobbying efforts of hawkish “pro-Israel” groups and their right-wing Arab counterparts. The spiraling violence these policies have engendered continues to represent a serious liability to U.S. foreign policy objectives, comprehensive peace settlements, and of course the lives and livelihoods of besieged Arab populations. Samer Araabi is a Right Web research assistant and a contributor to Foreign Policy in Focus. Mitchell Bard, The Arab Lobby: The Invisible Alliance That Undermines America's Interests in the Middle East, New York: Harper, 2010. John J. Mearshiemer and Stephen M. Walt, The Israel Lobby and U.S. Foreign Policy, New York: Farrar, Straus and Giroux, 2007. Dana Hdegpeth, “Saudis may get huge arms deal,” Washington Post, September 14, 2010, http://www.washingtonpost.com/wp-dyn/content/article/2010/09/13/AR2010091306429.html. Viola Gienger, “Saudi Arms Sale Prompts Questions from U.S. House Panel Leaders,” Bloomberg, November 4, 2010, http://www.bloomberg.com/news/2010-11-03/saudi-arms-sale-draws-concern-of-u-s-house-committee-leaders.html. Helene Cooper and Mark Landler. "Leaders Call for Peace as Mideast Talks Begin," New York Times, September 1, 2010, http://www.nytimes.com/2010/09/02/world/middleeast/02diplo.html. James Drummond. “QIA and Israeli Group Invest Jointly in Fund,” Financial Times, August 12, 2010, http://www.ft.com/cms/s/0/f4ec1874-a632-11df-8767-00144feabdc0.html#axzz164OCqQhd. Nathan Guttman, “Israel Quietly Accedes to Huge Saudi Arms Deal, The LargestEver,” The Forward, October 27, 2010, http://www.forward.com/articles/132611/#ixzz15eZs0dwh. Jones, Clive. Britain and the Yemen Civil War 1962-1965: Ministers, Mercenaries, and Mandarins: Foreign Policy and the Limits of Covert Action.Portland: Sussex Academic Press, 2004,p.135. Mitchell Bard, The Arab Lobby: The Invisible Alliance That Undermines America's Interests in the Middle East, New York: Harper, 2010, p. 348. Yossi Alpher, “Plenty of blame to go around over the failed peace process,” Daily Star, October 22, 2010, http://www.dailystar.com.lb/article.asp?edition_id=10&categ_id=5&article_id=120679#ixzz15ef7zIwJ. J Street, “The US Israel Relationship and Foreign Aid,” JStreet.com, http://www.jstreet.org/page/the-us-and-israel.